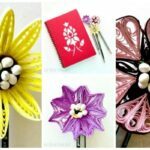 It has been a little while since we shared a lovely Quilling for Beginners project with you – we love paper quilling and love paper quilling for kids EVEN MORE… when introducing kids to quilling, you can set aside the attention to detail.. keep it simple and fun and the results will be no less gorgeous. 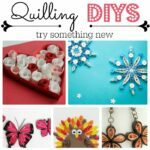 Today’s Quilled Christmas Tree Cards where inspired by our **lovely** Quilled Heart Cards, that Craft Whack did for us many moons ago. 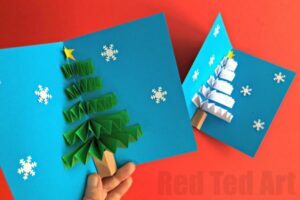 It is such a simple and wonderful technique and the results are gorgeous, that we wanted to do Christmas version too (in fact.. check out our Paper Quilled Emoji Cards too.. 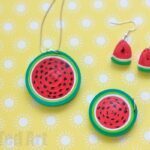 fab!). 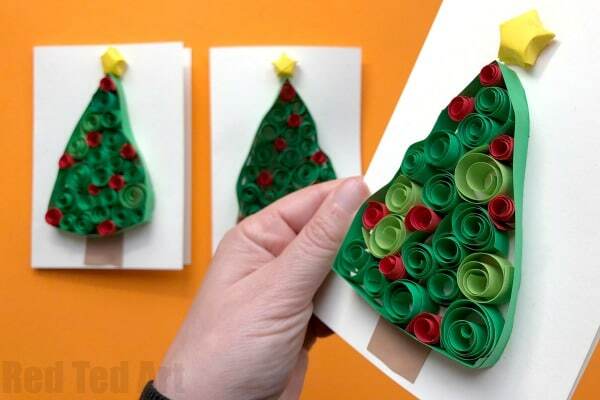 Though this isn’t a DIY Christmas Pop Up Card, I do think the 3d quilling effect looks rather fabulous too. I just love how the light catches in and shows different colours and shades. 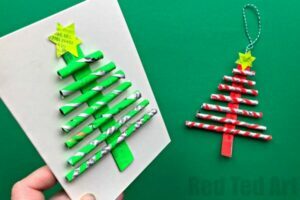 These quilled Christmas Tree Cards were published in November 2017 and republished for your convenience! Yes it is video time again.. however, as per usually, I added written instructions for you below the video. So please do choose the format you find more convenient!! 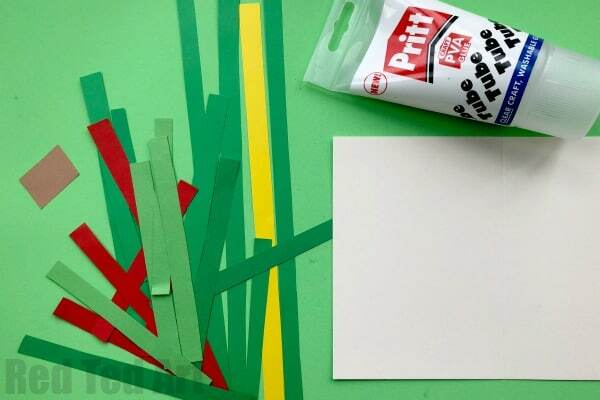 Cut strips of colored paper – approximately 1cm long, 14cm wide. You will need a couple of longer ones too apporx 28cm (or the full length of your paper). 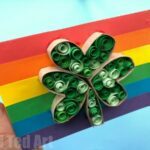 You will need mainly green – if you have different shades of green, all the better! Plus one long strip of yellow (for the star later) and some 7cm x 1cm strips of red (maybe 6-7 of these). 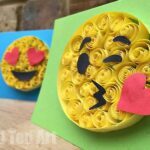 Older kids can use a craft knife to cut strips, but we found scissors worked quite well- the strips don’t need to be perfectly even. 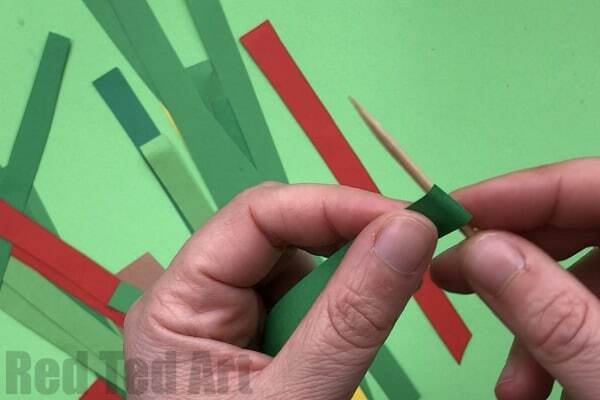 Coil the green strips, one by one, tightly around the toothpick or knitting needle. They will stay coiled when you remove them. 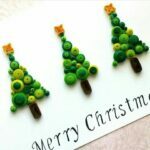 Save the ONE long green one for the tree outline and the yellow one for later. 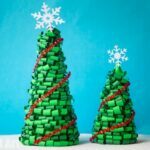 Now.. you can either prepare the “tree shape” ahead of the crafting session and let it dry FULLY – this will result in a beautifully triangular Christmas tree shape…. OR… like us.. you can skip the drying process and proceed. HOWEVER, this results in a different “finished effect” of slightly wonky trees. I LOVE the “wonky” look of our trees.. as it personalises each one. However it really is a matter of personal preference! 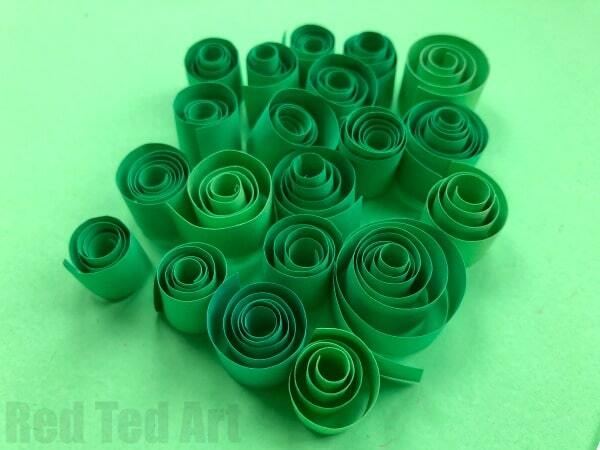 Fold your long piece of green into roughly 10cm, then 10cm and then 7cm – leaving 1cm at the end. 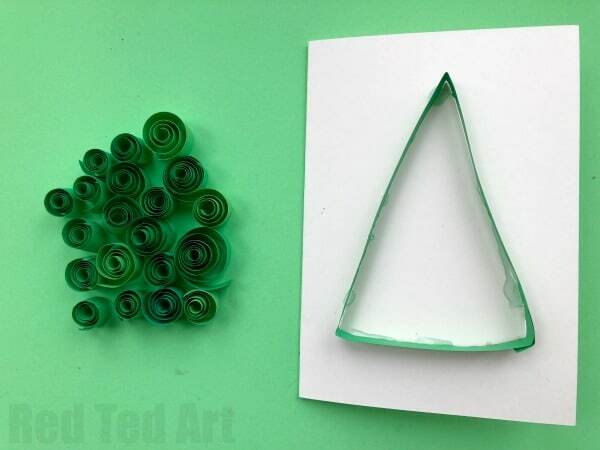 It is not an exact measure – but the 10, 10 and 7 will form the sides of your Christmas Tree Triangle. 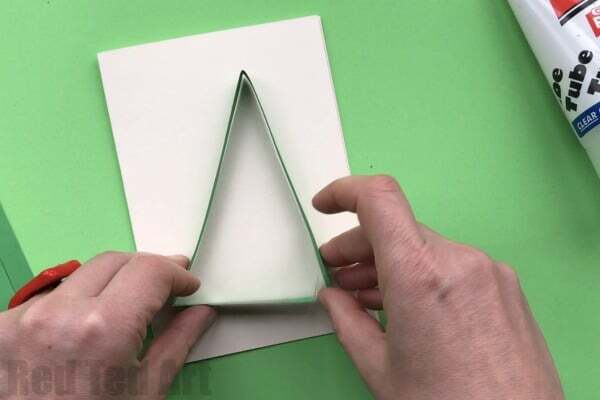 Glue your 1cm fold to the top of the first 10cm section = triangle made. 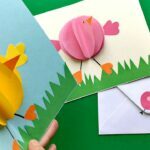 Now run some glue along the edges and position on the A6 Card – leave space for a small trunk and a little yellow Lucky Star. 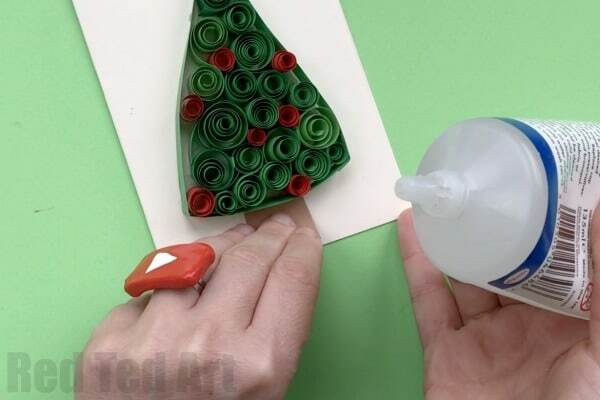 Now fill the inside of your tree with glue and start placing your green coils. Once it is more or less full. 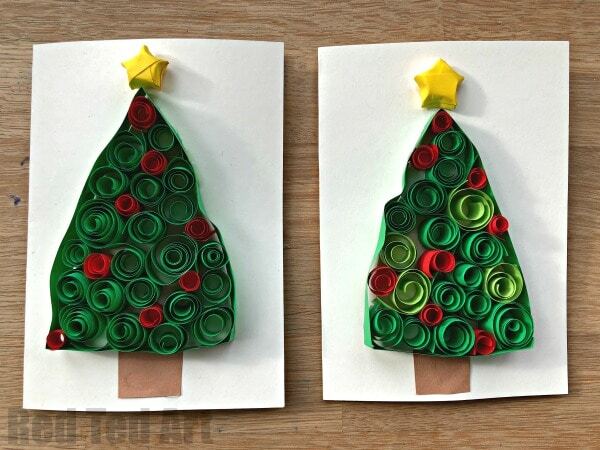 Make some little red coils and fill the gaps as if they were little red Christmas Tree Baubles. 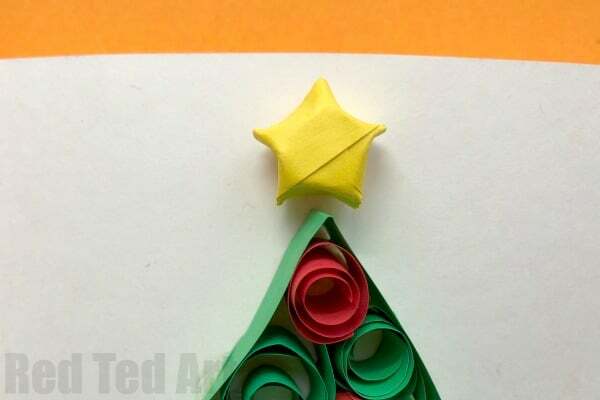 Finally make a little yellow 3D Star – learn how to make a lucky star here. Love how the light catches the paper quills! 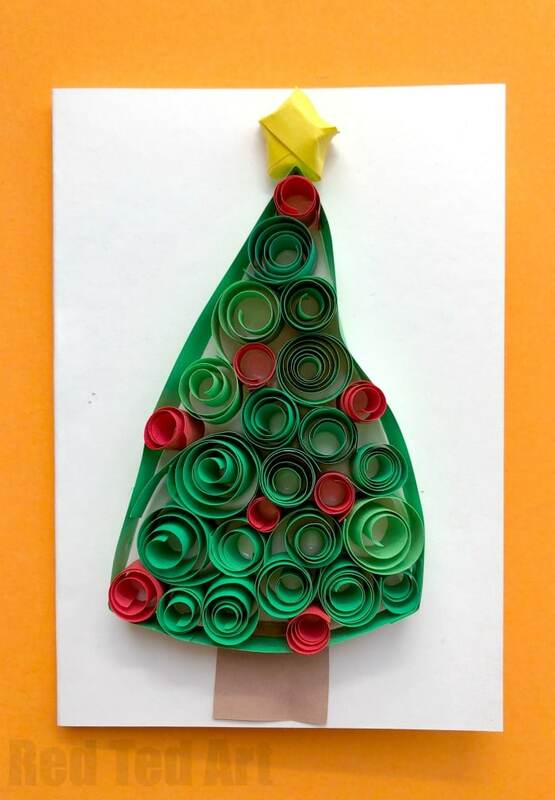 Your gorgeous DIY Quilled Christmas Tree Card is done!